Free stuff is everywhere! Especially on garbage day. Just this very morning I picked up some perfectly good spruce 2x4s sitting on top of someone’s garbage can. We’ve previously discussed using carpet padding as a “router pad.” The same free pad makes a good, cheap cushion to stand on while you work. You can find it on at the curb on almost any trash day, when people change out their carpet. With a regular office stapler, you can put two (or even three) layers together for some extra padding. Why not? There is no limit, no “one to a customer,” you can take all you want. Anything that relieves stress and fatigue will allow you to stay in the shop longer. If you use the same material for your router pad, be sure to keep it separate, so that you don’t introduce dirt, and thus, scratches, into your work. 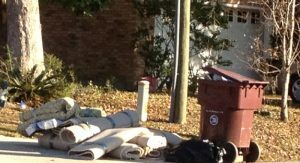 If you’re willing to swallow your pride, or get up before dawn so as not to be seen by your neighbors, there is an unlimited amount of carpet pad, free for the taking on trash pickup day.